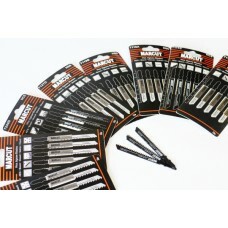 MARCUT Jigsaw blades manufactured from high-quality materials to suit a wide variety of industrial applications. Great for builders, joiners, restoration contractors, agricultural, fabricating. Wood Cutting & Laminates | Bosch No T101B (1 pks) HGS Curved for quick cuts in all wood ..
Wood Cutting & Laminates | Bosch No T101B (5pks) HGS Curved for quick cuts in all wood m..
Wood Cutting & Laminates | Bosch No T101BR (1pks) Downward cutting for splinter-free cuts. Id..
Wood Cutting & Laminates | Bosch No T101BR (5pks) Downward cutting for splinter-free cuts. Id..
Wood Cutting & Laminates | Bosch No T101D (1 pks) Downward cutting for splinter-free cuts. Id..
Wood Cutting & Laminates | Bosch No T101D (5pks) Downward cutting for splinter-free cuts. Ide..
Wood Cutting | Bosch No T111C (1pks) HGS Curved for fast rough cuts in all wood materia..
Wood Cutting | Bosch No T111C (5pks) HGS Curved for fast rough cuts in all wood materia..
Wood Cutting | Bosch No T244D (1 Pks) HGS Curved for quick cuts in all wood materials, ..
Wood Cutting | Bosch No T244D (5 Pks) HGS Curved for quick cuts in all wood materials, hardw..